KDE's default Breeze theme is a beautiful piece of artwork and looks really nice with Plasma desktop. If you long for a similar look in GNOME desktop, you can install Breeze GTK themes shipped by KDE. These themes come with light and dark variants. They also have smaller titlebars and lesser padding than GNOME's default Adwaita theme. You can further customise GNOME to look like KDE by installing packages below. You can use Gnome Tweak Tool to change icons, themes and so on. 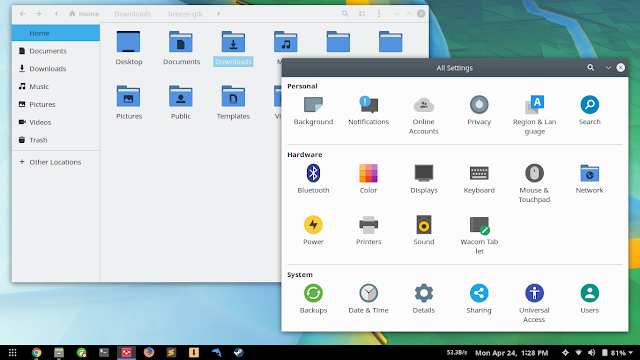 Unfortunately, a GNOME Shell theme matching Breeze's look and feel isn't available yet. However, you can change GNOME Shell's font to Noto Sans by following our guide from here.